Q: Will I be sacrificing performance and style using WaterSense® bath products? A: Homeowners typically use over 70 gallons of water a day per person. Much of that usage stems from bathroom activities. High-design, high-efficiency plumbing products for toilets, faucets and showerheads are now available and can reduce water consumption by 20 percent. For example, water flows from a standard showerhead at 2.5 gallons per minute (gpm), so a 10-minute shower (with the water running continuously) nets 25 gallons. This is why using a WaterSense® approved showerhead is so important to water conservation in your home. WaterSense® products must have a flow rate of 2.0 gpm or less, while also meeting performance requirements for flow rate across a range of pressures, spray force and spray coverage. When it comes to high efficiency toilets, these models must consume no more than 1.28 gallons per flush. All faucets must have a gpm of 1.5 or less and must obtain third-party verification in order to qualify for the WaterSense® label. This contemporary green house plan features radiant heat installed under the tile and stone floors for an even distribution of heat and energy savings. The wood floors in this open, eco-friendly kitchen are made from Morning Star® bamboo flooring by Lumber Liquidators®. Q: Is insulation made from denim and newspaper really efficient? A: Eco-Insulation products like cotton fiber and cellulose are not only great for the environment but a healthy way to assist in achieving total home comfort. Cotton fiber consists of a batted material, usually denim, which has been treated with the chemical borate to make it fire and heat retardant and to prevent it from developing mold. Since the material does not off-gas and is non-toxic in doesn't require warning labels. It retains its R-value in colder conditions, has superior acoustical properties and requires less energy to manufacture. Cellulose insulation is made from finely shredded newsprint and contains 85 percent recycled content. It is chemically treated with non-toxic substances to reduce mold and promote fire resistance. It can reduce heating and air conditioning bills by up to 20 percent annually. 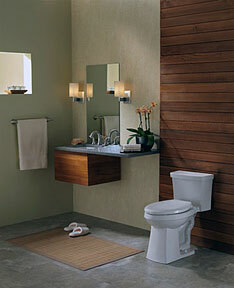 For a simple sleek line, Danze® offers the Cobalt™ 1 Piece High Efficiency Toilet. Browse the latest additions to this recently updated collection, which is perfect for small spaces. 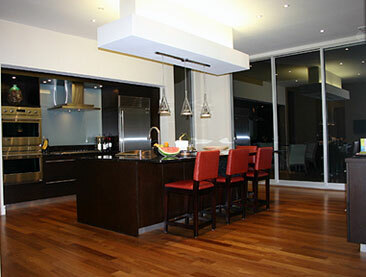 Q: What are the benefits of bamboo flooring? A: Bamboo flooring is growing in popularity as an alternative to hardwood flooring because it is uniquely attractive, strong and resilient, moisture and stain resistant and environmentally friendly. It typically cost 25% to 50% less than hardwood and many come with 10 to 25-year warranties. Q: Should you consider solar water heating? A: With the constant rise in energy costs, building a new home is the perfect time to consider installing a solar water system. The great thing about installing a solar water system is it's powered by the sun, a free and natural resource. By using the sun's free energy you can cut your hot water energy consumption in half depending on where you live, while helping the environment by cutting back on greenhouse gas emissions. Like all renewable energy products, a solar heating system qualifies for many tax incentives, rebates and discounts. Keep in mind the best time to purchase a solar water heating system is when you are building a new home. For example, over the cost a 30-year mortgage you will be paying an average of $13 to $20 a month for a solar water heater. Think of the long-term benefits of having free hot water and the comfort of knowing that you and your family won't be as effected by fuel shortages and price increases.